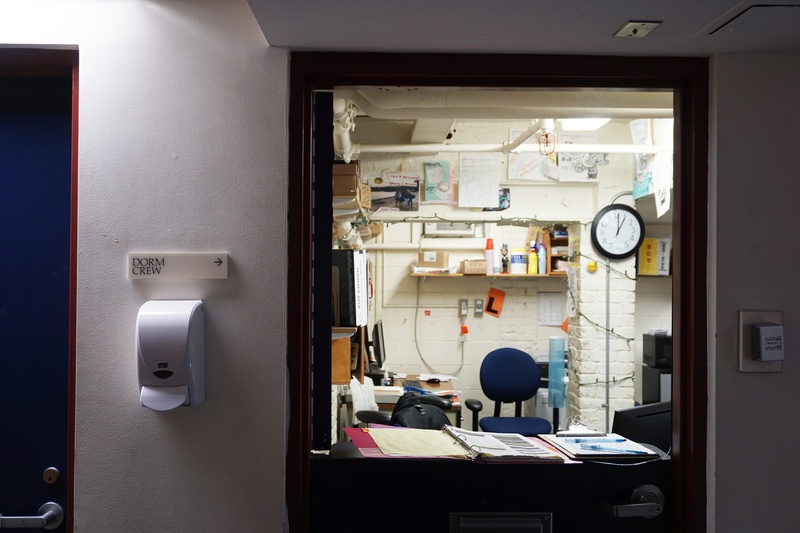 The Dorm Crew office is located in the basement of Weld Hall. Many undergraduate participants, though, say it is a well paying job like any other. Sara Y. Goldrick-Rab, a professor of higher education at Temple University, sparked a heated exchange on Twitter last Friday with a message questioning the Harvard program. “Low-income students at HARVARD working 20 hours a week in their first year of college cleaning goddamn dorms?? And we keep giving this wealthy place our public dollars why exactly?” Goldrick-Rab wrote, including a link to a Hechinger Report article on student debt at the nation’s top colleges. The tweet quickly polarized academics, students, and others who responded on Twitter. Some wrote they agreed with Goldrick-Rab, criticizing with the longstanding College program and arguing it forces low-income students to work for their peers. Others — including many current Dorm Crew captains — disagreed both on Twitter and in interviews with The Crimson, arguing Goldrick-Rab mischaracterized the program. College spokesperson Aaron M. Goldman declined to comment on Goldrick-Rab’s tweets. Dorm Crew, founded in 1951, runs in three phases: Fall Clean-Up, a pre-orientation program for entering freshmen; term-time cleaning in several upperclassmen houses; and Spring Clean-Up following final exams and Commencement each year. Similar programs have also come under scrutiny after Assistant Professor of Education Anthony A. Jack at Harvard Graduate School of Education published a book on his research on socioeconomic initiatives at elite universities. In the book, he mentions some universities have programs that pay students to do janitorial work. Those students often come from low-income backgrounds. In an interview with The Crimson, Goldrick-Rab said she is surprised by how strenuously many Dorm Crew participants defended the program. She argued the College should not use public funds — by way of the Federal Work Study program — to pay students’ Dorm Crew wages. “A $39 billion endowment — you don't have to be using work study funds to pay for them,” she said. Some students said they enjoy participating in Dorm Crew because the work is more active than many other on-campus jobs. Bravin and other students also pointed to the fact that — with pay starting at $16.25 per hour with the potential for raises — Dorm Crew pays far better than many other on-campus jobs. “It's a really great way to, like, earn money on campus and offers a flexible schedule,” Grabin said. Other students tweeted in reply to Goldrick-Rab, arguing she and the Hechinger Report article misrepresented the program. “I am middle class, on financial aid, and work for Dorm Crew entirely because I want to,” Amanda D. Maille ’21 tweeted in response to Goldrick-Rab. Daniel I. Mendoza ’21, who began working for Dorm Crew in 2017, said he was excited for Fall Clean Up because it was the first job he was able to take after receiving a green card. He said he thinks critics of Dorm Crew do not understand it. Other College students, however, painted very different pictures of Dorm Crew, saying that low-income students often feel pressured into taking jobs that they feel often entail demeaning or degrading work. Some Dorm Crew participants, however, said they think the job is like any other, and the day-to-day work simply involves a few hours of cleaning and getting a rare peek into the lives of their classmates. “I know that a lot of people put their toothbrush like on the bare counter and I think they should like put it in a cup or something to keep it from touching the counter,” Bravin said of her on-job observations. “Some people like hoard toilet paper. Some people like never have toilet paper,” she added.